THIS WEEKEND WILL stay bright, dry and cold, but the evenings will be freezing. Met Éireann says that today will stay dry with variable cloud amounts and crisp sunshine. Top temperatures will hit 11 degrees, with the west becoming a little warmer. 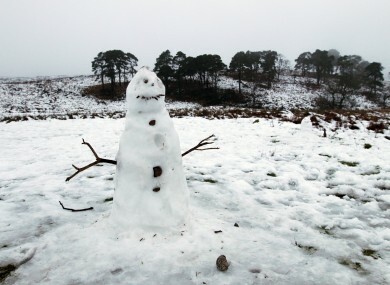 Tonight will be “cold and dry across much of the country with clear spells”. Lowest temperatures will dip below freezing. Tomorrow will be similar, though cloudier. Evening temperatures will be in the low single figures. Into Christmas week, the rain along western parts will spread east during Monday, but will become broken and showery as it progresses east. The falling temperatures will see a risk of snow showers starting along western coasts, and particularly over high ground in the northwest. The further outlook for the later part of next week and until Christmas is for unsettled conditions, with snow showers likely to continue in the west and northwest for Thursday. Email “There will be snow during Christmas week”. Feedback on “There will be snow during Christmas week”.